Home remedies for common illnesses such as the flu are exciting by all counts, but this fruit may be particularly exciting because, in our case, it grows wild near us. We can harvest it easily and for free. We use it in elderberry syrup and elderberry tea. Is elderberry really effective against the flu? In our household we try to consume our homemade concoction regularly in tea but when you are downed by severe flu symptoms, is a berry going to make any difference at all? Apparently so. In a 2004 study in the Journal of International Medical Research researchers found that taking 15 ml of a specific elderberry extract (Sambucol) reduced flu symptoms fairly dramatically within two days of taking the supplement. The study used a randomized, double-blind, placebo-controlled study of flu patients and measured self-reported changes in their flu symptoms. In the graph below, I plot the improvement in flu symptoms (cough, sleep quality, mucus discharge, and nasal congestion) against the days since treatment. Those in the treatment group had much quicker improvement in symptoms. 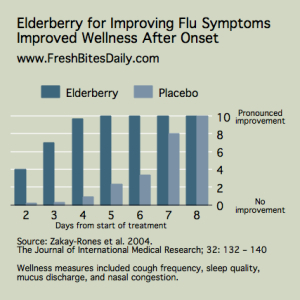 Second, in my opinion, the key take-away from the 2004 study is that participants consumed elderberry within 48 hours of the onset of flu symptoms. You know when you feel that sore throat or scratchy eyes and you ignore it and hope it goes away and then it doesn’t? At that stage where you are “ignoring it,” you should be consuming the elderberry. 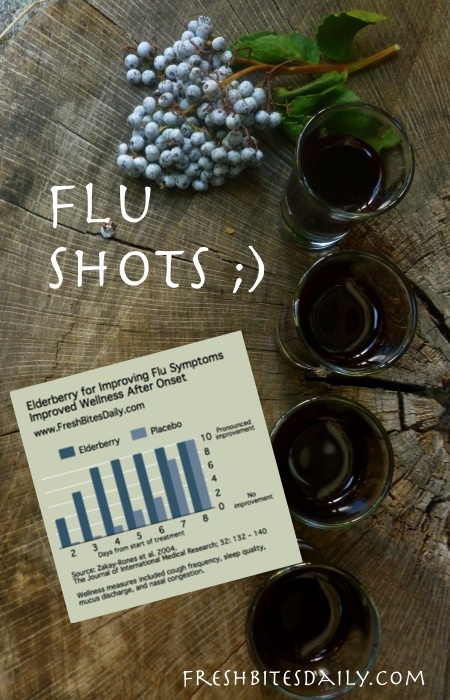 8 Comments on "Your handy elderberry “flu shots” and what research says about using it for the flu"
Thank you for sharing the scientific study! I’ve never made elderberry syrup, but can’t wait to try. 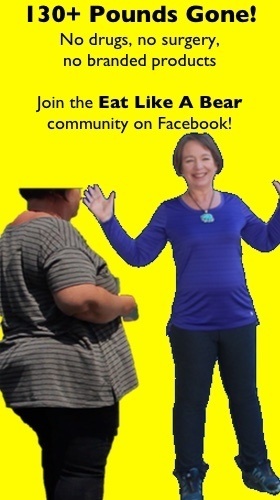 🙂 I would LOVE it if you would share this post on Wildcrafting Wednesday! I have been taking elderberry since I was a kid and my mom would make me. I now give it to my 4 kids everytime they get sick and when we are around people that are sick. It has proven true in our household as well, that it does make a huge difference in our health for the good! So glad God gave us simple things like elderberries to help us stay and get healthy again! I saw a commercial recently for elderberry syrup and was wondering about it. What is the difference between the ones that say for cold/flu and the ones that don’t? Can you take it regularly? Thanks for presenting Elderberry that fight against flu symptoms. Is this compatible for kids or not? Cos nowadays mostly of the kids now are having flu. Yes, Sambucol Black Elderberry even has a special Kids formula, or they can take the Original Syrup in half doses! I love elderberry! It stops any cold I’m starting to have in its tracks! I buy it dry in bulk from my health food store. I make a tea with apple juice, dried elderberries, cinnamon stick, and enough grated fresh ginger to make it spicy! This tea has never failed me! This is great to know. We don’t have elderberry’s near us but I have seen the syrup in the stores and wondered if it was effective.